Garden Marjoram, Knotted Marjoram, Gartenmajoran, Huile de Marjolaine,Marjolaine,Majoran, Majorana Herb, Origan des Jardins, Majoranahortensis, Majoranamajorana, Marubaka, Mejorana, Origanummajorana, Sweet Marjoram. Marjoram is a herbaceous plant with red or white flowers and distinctive strong flavour. It is related to oregano. Used as both a spice and herb and for the purposes of perfumery. The antispasmodic, antiseptic, actionof Marjoram can stimulate digestion. Used to butter-based sauces, fish sauces, vinegar, tomato-based sauces, eggplant and mushroom sauces. 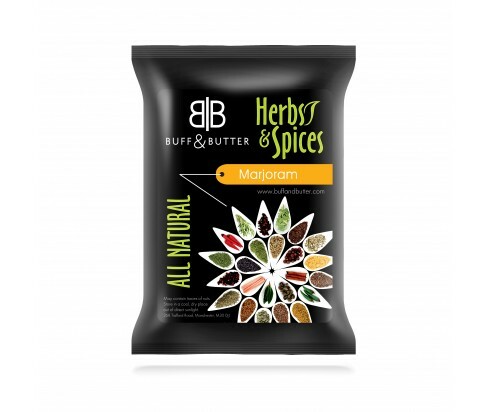 Dried marjoram is used with thyme and different flavours in various sorts of sausages. The dried seeds are used to flavour confectionery and meat items. Italians use it in pizzas, tomato sauces, vegetables and fish dishes. It runs well with vegetables including potatoes, beans and cabbages. Marjoram is often used as a garnish. Marjoram tea can ease your side effects of flatulence, stomach issues, nausea, constipation or diarrhoea. Marjoram can be a useful common solution for peoplewith high risk of hypertension and heart issues. Reduce the pains that come from migraines. Manage the menstrual cycle and restore hormonal balance in the body. Dried marjoram helps to hold the colour of carotenoid pigments. Marjoram can treat poisons, convulsion and dropsy as well. According to Greek legend, marjoram originates from the Mount Olympus, where its aromawas said to be favourites of the goddess of love, Aphrodite. Marjoram is indigenous to northern Africa and south-west Asia. It is developed around the Mediterranean, in England, Central and Eastern Europe, South America, the United States, and India. Marjoram is a perennial plant, 60 cm high. Leaves opposite, fluffy, greyish green, whole oval, 1 to 2 cm long. Small white or mauve flowers, gathered in tight clusters in the axils of the leaves with two bracts in the shape of a spoon.